A Series of Unfortunate Events is here and it's your job to halt Count Olaf's trail-of-terror. 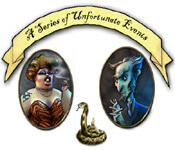 Stop Count Olaf's unmentionable HORRORS with fire, snake bites, leeches, and other wieldy machinations in this fascinating game of logic and deductive reasoning. Too awful of a game? Too scary and dark? Too spine-tingling a premise? Well, then, go play something cheerier.<BR><BR>You've been warned! Do NOT download this game if you can't stand up to Evil! A Series of Unfortunate Events is rated 4.5 out of 5 by 28. Rated 5 out of 5 by callmecrystal from Cool Game Sound effects are so funny. Game is so simple, yet so entertaining. Glad I purchased this one. Usually only purchase HO or Match games, but made an exception for this gem. Thank you Big Fish! Rated 5 out of 5 by SixSigma from Good Challenge I really liked this game. Don't try to watch TV while playing because you really need to focus on the clues. After reaching level 8, I realized I need to schedule an eye doctor appointment. The icons are really small. That just adds to the challenge. Rated 5 out of 5 by catladyx10 from Addictive Fun!!! I absolutely love this game!!!! I was looking for something different from what I normally play and began looking into different genres. I looked at this game, read the reviews and did the free trial. At first I got confused about the right and left clicks and gave up, believing it was too confusing for me. I went back to it and finally got the hang of what I was supposed to do. I must admit, this game is great fun. Challenging, makes you think and certainly makes the time pass quickly. I get so caught up in playing that I forget to go back and check on my food preparations!!!! Yikes!!! I definitely recommend this game. I did buy it and have played two different levels and am ready for more! Rated 5 out of 5 by Aribear from Very Unique and fun as heck! I am always on the look-out for games that don't fall into the usual categories, and I must say this game was a breath of fresh air. I love games that are challenging, and make me use my brain. This game filled the bill. I have played it three times now, and can imagine myself playing it again and again. it is randomized so it has loads of replay value. It reminds me of two of my favorite games as a kid: Battle Ship, and Clue. There are funny characters where bad events happen in the rooms of a large house like in Clue. It uses a grid system to allow us to eliminate suspects and possibilities like in Battle Ship. My only complaint about this game is that as you progress, the icons get very small, and that is when you can accidentally mis-click on icons and lose chances. But, over-all, I loved this game! I wish they had made a sequel. Rated 5 out of 5 by coffeyfan77 from Unfortunately Excellent I'm a big fan of the books on which this game as based, and therefore can appreciate the tone throughout. This would be a prime example of a very simple concept that turns into a way better game than it might first appear to be. You'll eliminate options through increasing rooms of Count Olaf's mansion, while discovering more characters and items that directly relate to the original tales. With a few levels of difficulty and two completely different (but clearly related) games, you'll have hours of play available. In addition, as mentioned by others, the boards randomly generate, so you'll definitely find yourself coming back for more. You will also get some trivia from the books as you play, but the main feature here is the addictive logic puzzle that makes up its core. The animation is fine, though nothing special, but it's a really fun diversion. Never gets old for me. Rated 5 out of 5 by ladymblack from Electronic Logic Puzzle If you've ever enjoyed logic puzzles, then you probably want to give this a go. It's an old game, so action is a bit slow, but don't let that deter you. The game has two modes, and both offer increasing difficulty as you move forward. Rated 5 out of 5 by arnold1049 from DID YOU READ THE BOOKS? I did, and it made this game so much more enjoyable. 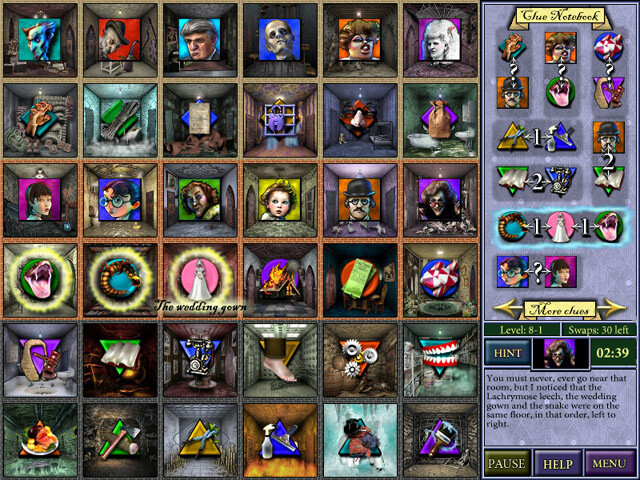 This is a deductive reasoning game where there are from a few to many rooms, each containing a selection of items such as villains, victims, motives, weapons, escapes and punishments. Using clues, you must eliminate items from each room until you have narrowed each room down to one item, which will then show who did what to whom, why, etc. There are 2 ways to play and 3 levels of difficulty for each way, so you have plenty of options. And because the board of rooms is randomly generated, this game can be played over and over again. It is not as easy as it sounds, as you are allowed only one wrong click for each board. When there are 36 rooms to a board, with 10 or more items to a room, this can be hard, When you get to that many rooms, the items in the rooms are extremely tiny and I found that I had to be particularly careful with my pointer, as several times it would move just a bit and I would click on the wrong thing. Also, sometimes, if I left it stationary for too long, it would automatically click on whatever it was resting on. If you make more than one mistake, you have to start over again, but the board and the clues will be different each time. 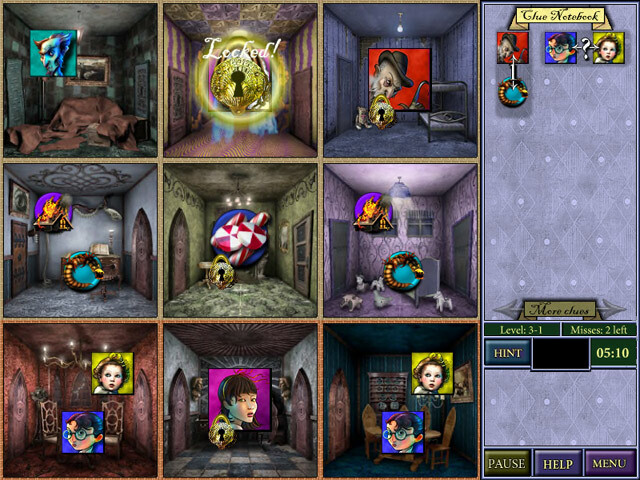 The game contains a lot of hints as you are playing it to help you use the clues in the proper order to get the quickest solution. Although there is not a time limit to the boards, there is a target time for the board. I was never able to meet that target because the targets seemed unattainably low. I did finish one small board in 45 seconds, but the target time was 30 seconds. Sometimes I barely had time to review the clues before the target time was over. Not meeting the target time did reduce your score, though. A very enjoyable game that I will play again and again. Rated 5 out of 5 by lfrank88 from Fun Puzzle Game This is a really fun game if you like logic puzzles. My only complaint is that it's almost not challenging enough, but it's still fun and worth the money.